When Florida couples are engaged, they are so in love. They may not think about anything but planning the wedding. They may not become of their partner’s spending habits until after the honeymoon, when the romance has worn off. As a result, these couples may spend hours fighting over finances. A new job or business opportunity may also add fuel to the fire. Is divorce imminent? What options do these couples have to overcome their financial differences and continue with life as a couple? Fortunately, a postnuptial agreement may be able to help. This type of document not only outlines financial expectations during the marriage but also in the event of a divorce. Read on to learn more about what a postnuptial agreement can do. If a person is concerned about a partner’s out of control spending, a postnuptial agreement may outline who pays for what in a marriage. For example, one partner may pay the recurring bills, while the other may pay off loans such cars and credit cards. In most cases, though, these agreements discuss what will happen in the event of a divorce. For example, they outline how assets and debts will be split. The agreement can include virtually anything about financial issues. However, it cannot discuss child custody, child support or alimony. These are public policy issues and cannot be limited by a postnuptial agreement. If these topics are mentioned, the agreement will not be considered valid. You and your partner don’t need to be in dire financial straits in order to get a postnuptial agreement. Even marriages in which things are going smoothly may be able to benefit from the planning that this document offers. For example, if you start a business during the marriage, a postnuptial agreement can work in your favor and help protect your assets. If your spouse presents you with a postnuptial agreement, it’s in your best interests to have it interpreted by a lawyer first. In many cases, these agreements tend to be one-sided, favoring just one of the partners in the marriage. You want to make sure your rights are protected, too. By signing the document, you may lose out on a large chunk of money in the event of a divorce. Before you sign, make sure you understand and agree with everything set forth in the document. If you don’t, plan to negotiate before signing. Fighting Over Money? We Can Help! Not many couples consider prenuptial agreements when they’re engaged, but once the honeymoon is over, the money arguments begin. If you’re concerned about your assets, you still have time to protect them by getting a postnuptial agreement. 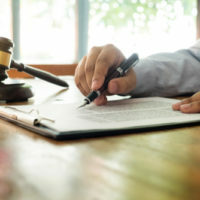 A postnuptial agreement can serve as a separation agreement should you and your spouse continue to fight over money and eventually go down the path of divorce. Learn more about how a postnuptial agreement can help your marriage by calling the Dade City family law attorneys at Mander Law Group. Schedule your consultation today by contacting us at (800) 557-0411.